Lightweight, sturdy and professional. It is much more than meets the eye. It is easy to install, stable and you can put more in it, than you think. Sortimo has been developing in-vehicle equipment for more than 35 years. With many years of experience our in-vehicle equipment is innovative, efficient, high quality and our employees have contributed to its great success. Quality throughout: Sortimo innovations set the standards for the in-vehicle industry. With one objective in mind: to once more significantly increase the quality of our products. Being the market leader and partner of renowned vehicle manufacturers, our basic principle is applied to both mobility and our demand for the highest possible quality with certified safety. Sortimo has been certified in accordance with DIN EN ISO 9001 for high quality. Our entire product range has been awarded the German TÜV stamp for approved quality. Sortimo is an approved direct supplier to their automotive partners based on its VDA 6.1. certification. VDA 6.1. regulates the additional requirements of a quality management system for suppliers of the automotive industry. Sortimo products are manufactured at our highly modern factory site in Zusmarshausen, Bavaria. We’re proud to say „Quality made by Sortimo“ stands for safe and approved in-vehicle equipment systems. Convincingly simple and versatile: good in-vehicle equipment is easily recognised by its functionality and variability. Globelyst is based on the very sturdy AluSpaceFrame construction. Shelves, drawers, boxes and service cases of different depths and widths can be integrated with ease in the frame. Our equipment elements are screwed to the Soboflex safety floor or Sobogrip floor insert without any drilling of the vehicle floor. Thanks to this variability you can easily change your Sortimo Globelyst equipment from your old vehicle into your new one.The function of Globelyst is simple, effective and revolutionary at the same time. It gives you an unlimited number of selective combination possibilities. Being light and rigid at the same time is made possible by the AluSpaceFrame innovation. Based on our experience with professional in-vehicle equipment we know how important it is to have all technical components interacting smoothly. Our innovative hybrid construction of our in-vehicle equipment is made of aluminium and steel. The way these materials are used and combined with other materials produces the best solution. Sortimo is the first and sole manufacturer of in-vehicle equipment greatly benefiting from this principle. It is said that those who are tidy are just too lazy to look for anything. Sortimo Globelyst ensures that tools and parts are quickly to hand to speed your work. You save time because there is less searching your vehicle for tools and parts. Your professional vehicle equipment gives you and your company the good image you deserve. Sortimo is environmentally friendly. The entire production process from the development phase to final production more than fulfils the international ambient protection regulations. The optimised structure of the in-vehicle equipment elements and the increased use of separate connectors guarantee that all Sortimo Globelyst components can be disposed of completely and 100 % recycled. 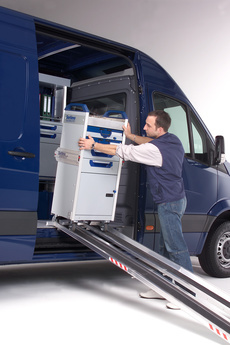 Sortimo in-vehicle equipment makes it easier to secure the load. Our equipment considerably improves the passive and active safety of the driver and the load. This is a very important aspect as the number of accidents with CVs has increased dramatically in the last 5 years. Many accidents are caused by unsecured cargos. Continuous crash testing in accordance with ECE17 with our partners from the German ADAC, Dekra, TRL, TÜV and UTAC always bring us excellent results and confirms the extra safety offered by Sortimo in-vehicle equipment. Crash testing also shows an increased chance of survival with safely stored materials and tools. To save means to be economical. Increasing petrol costs concern all of us. One more reason for our lightweight construction, AluSpaceFrame. Our uncompromising reduction of weight helps to save energy and reduce costs. The rule of thumb says that every 100 kg less weight reduces petrol consumption by 0.3 to 0.5 litres – which means less CO2 emissions. An excellent product deserves excellent service. Our extensive sales network offers you high quality consultation, planning service, in-vehicle fitting and after sales service. Sortimo offers 3 years guarantee if the equipment has been fitted by one of our authorized partners. Sortimo Globelyst has a clear and timeless design and smooth surfaces. Thanks to our development engineers Sortimo Globelyst is very user-friendly and ergonomically. Last but not least, the costs: because you save time each day not having to search for anything in your vehicle, you’ll notice the “return” on your Sortimo in-vehicle equipment investment within a few months. The advantages and high performance of Sortimo Globelyst has been proven more than a hundred thousand times worldwide.